Since we moved into this house two years ago, it has gone through so many changes. It felt like a blank slate at the time -- the kitchen needed a spruce up, the entire house needed paint, the 2nd floor bathroom needed updating, the windows needed replacing, etc. etc. We decided early on that the two places we cared about fixing up the most were the kitchen and the upstairs bathroom. We replaced all 23 windows in the house. We scrubbed top to bottom. We quickly got to work by painting and replacing some of the dated light fixtures. We painted every room except our bedroom and our living room (it's HUGE with vaulted ceilings. That was a project for another day.) Next, we moved onto bigger things! We got a quote for the kitchen from Murphy's Design in Virginia and that seemed totally doable. We then got a quote from another company for the bathroom renovation, and that was exceptionally high for what we wanted. New shower tile, new floor tile, and a new tub with a glass door for $13.5k? Hard pass. We said no thanks REAL QUICK and put the bathroom on the back burner. We moved forward with Murphy's Design on our kitchen makeover and it is by far my favorite adult purchase I've ever made. So worth it. (That blog post is coming soon. Promise.) A year after that, I got a sponsorship opportunity from a brand for bathroom fixtures, and we decided to do a mini-makeover on our bathroom, too! What did it cost us all together? About 25-30% of what we were quoted when we first moved in. YES. WIN. BIG BIG WIN. I'll show you the before and after our bathroom another day, too... with links to fixtures, tile types, and all the ins and outs. BUT FOR NOW... I'm compiling a little list with tips, as well as my favorite fixtures + products, to liven up any space. All images are clickable + shoppable. Flat — This gives most forgiving finish with the best color payout. If you want a saturated, velvety wall, a flat finish will give you rich results. If your wall has imperfections like uneven texture, patches or joints, flat paint will absorb light and make them less noticeable. However, flat finishes are not very durable and need to be carefully cleaned. Scrubbing flat paint could wear down the finish and cause sheen to appear in patchy spots. • Best places to use flat paint: Ceilings (which tend to have flaws), accent walls, low-traffic rooms that don't need frequent cleaning. Low-Luster — Many consider eggshell or satin finishes to be the best compromise between pigment and strength. 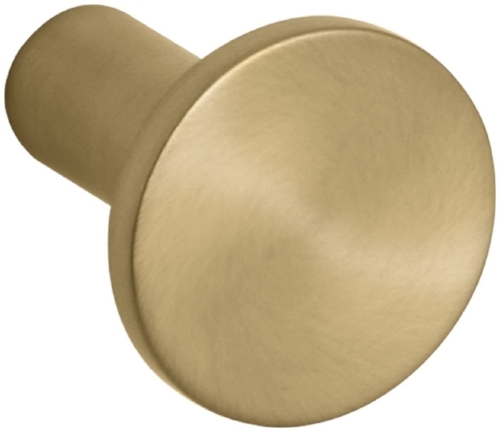 These finishes look matte from straight on, but viewed at an angle, they have a subtle sheen. This makes them longer-lasting, but the sheen does show imperfections, especially if your room gets direct sun, so prepping the wall and using a good primer is still necessary. • Best places to use low-luster: Living room, bedroom, dining room. Gloss/Semigloss — The most durable finish, it holds up well in humidity and is easy to clean, but it does reflect light, calling attention to any and all minor flaws. In order for it to look smooth and even, the surface must be perfectly prepped and the paint applied very carefully to avoid streaky, uneven sheen. • Best places to use gloss: Bathroom, kitchen, mud room, doors, baseboards. Even if you are RENTING your space and you don't own your space, many landlords will require you paint before you leave to cover wall holes and imperfections anyway, so this is your chance to have fun! This is another one of those give-in tips that most people would consider first but just don't do. If you don't know where to start in a room and you're feeling zero inspiration, start SOMEWHERE. One piece that inspires you will lead to the next coordinating piece and so on and so forth. 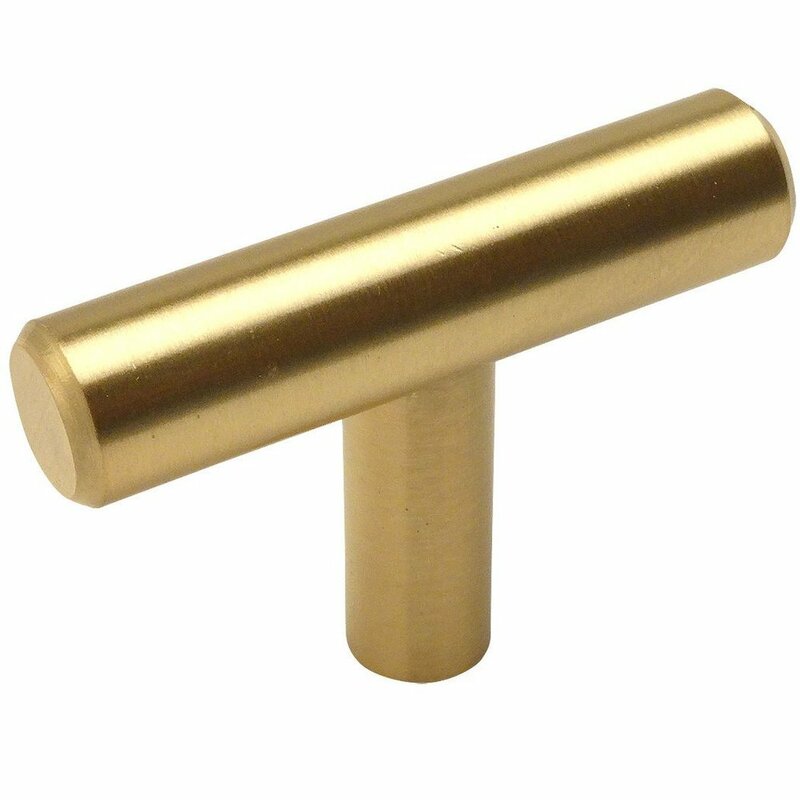 Many people start with cabinet and drawer knobs/pulls because they're a cheap and easy upgrade. If you rent, this is THE single easiest way to customize your space. Save the ugly knobs your landlord put on the cabinets for when you leave, and just put them back on like nothing ever happened. BAM. It's easier than paint by a longshot. Here are few of my favorite pulls and knobs around the web. Interested? Click any the below images. I believe the way to make a space feel the most spacious is to go vertical. Stack shelves, framed art, wall decor, etc. in a vertically clustered composition to create height (and in some cases, width). This can work with almost any style shelf; bracketed or floating. Shelves will always go down as a functional space-maker in homes and they have become more cost effective and aesthetically pleasing than your classic bookcase or armoire. There are lots of different types out there, but I am currently obsessing over acrylic. I'm not kidding when I say I am looking for somewhere in my home to make these babes work. For styling or knick knacks or what-have-yous, these are so fun. You can of course use any style shelf you want, but get rid of any clunky chests or large cabinets that are covering up wall space and manipulating the appearance of the height in the room. Open up the walls again! This is probably my favorite tip of all tips. Light fixture additions or replacements can be SO FUN. They can set the tone for the entire room. You remember how I mentioned above to just pick one thing you love (like drawer knobs, for example) and start there? It will set the course for the entire room. This applies so much ten times over with light fixtures. There are SO MANY out there to choose from. Thinking it costs an arm and a leg to do this? Don't want to pay an electrician a week's salary to swap out the light? TUTORIALS SAVE US ALL. 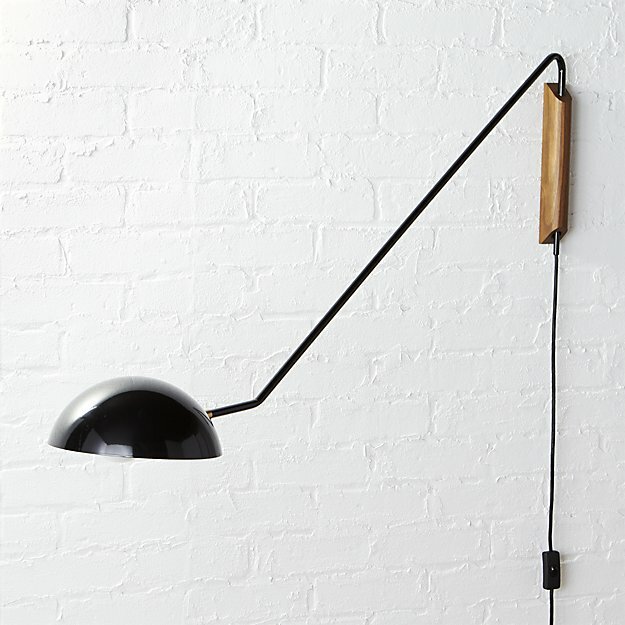 Here is one I found super useful for hanging a pendant light (like the lights I will show below). If this tutorial didn't help at all (tbh I am too clumsy to do this myself and this woman makes it look so easy??!?! ), there are deals on Angies List and Home Advisor all the stinking time for electricians. It's WORTH. IT. 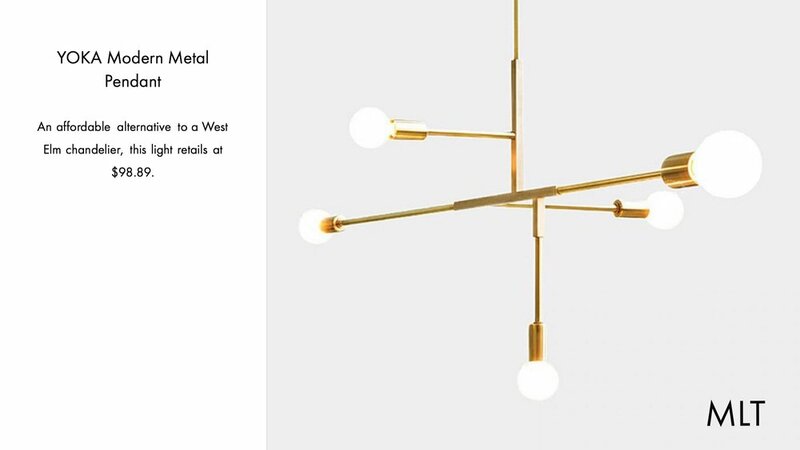 There are so many beautiful (and expensive) light fixtures out there and I know it feels like it's impossible to afford both an electrician AND the light of your dreams. I feel you. WE CAN MAKE IT WORK with a more affordable alternative. Here are two of my favorites that are comparable to some of the popular ones you see online these days, but for a fraction of the cost. Buy a single light for a hallway or powder room or set of two to accent any mirror, bed, or statement piece in your home. THEY ARE SO FUN. It can be expensive. I know. I am slowly moving toward saving money to buy art I really love from small business owners and artists I support. This means, I've cut back drastically in the last two years on random wall art purchases from Target, HomeGoods, etc. and have invested more in the photographers, painters and mixed media artists I love. What I HAVE been doing until I can save up to buy more of the artwork I really want is using reproductions of famous works of art as space fillers in my home. 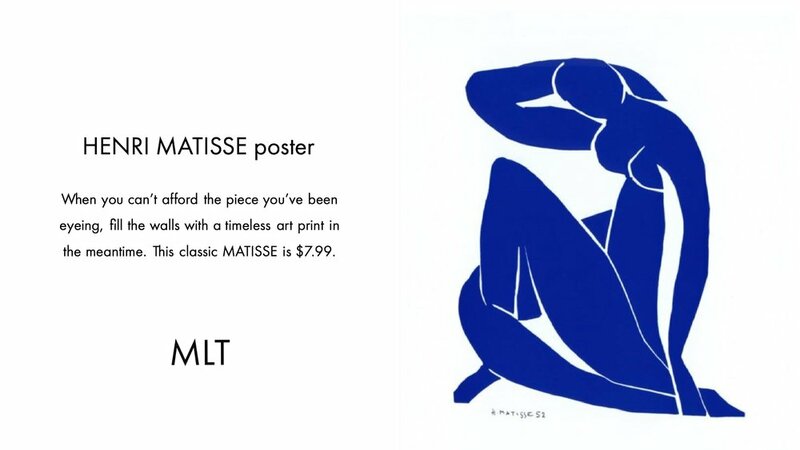 A few months ago, I purchased this print of a Matisse classic and put it in a $19.99 IKEA frame. It is HUGE. 24" x 36" and in a pig poster frame. The whole investment cost me just under $30. WORTH. IT. This is the print I am referring to. Click the image to explore. It is so easy to google the names of some of your favorite pieces of art or artists you love and find affordable purchasing options through poster retailers or amazon. You can also be even more of a badass and go out and support your local art museum, where I am sure they sell reproductions for you to frame at home. This is a good route to go, if it's an available option to you. + Does your space feel small? Try a mirror. Mirrors help bounce light around to open up space and make it feel larger. + Does your space feel cramped? Utilize any available closet shelf space by adding any items lying round that you don't use EVERY SINGLE DAY into baskets. Cube shaped storage systems with baskets at Target and IKEA are good options for this. Either way, get the junk out of your living space and organized by type in a closet or storage system. This is perfect in a hall or bedroom closet. + Does your space feel dark? Consider a lighter paint color (or same color with a more appropriate finish) or sheer curtains. + Does your space feel boring? Do ANY of your pieces go together? Do you have a brown suede couch with a purple loveseat and a white coffee table in a room with yellow walls? Let's show those pieces some love because chances are, they still have a lot of life left in them. Throw blankets and pillows can break up some of the harsh colors and lines of bold colors. Couch covers can reinvent an old couch. Google it because there are so many couch covers out there in tons of different dimensions. Also, a fresh coat of brand new stain on your coffee table can help tie lots of different elements in a room by bridge the tone gaps. Let me know your thoughts in the comments! Don't forget you can shop any item by clicking the picture, or do some exploring of your own. Happy sunday!